Thanks guys, that’s really my favourite article series. I am actually delighted by this article. I don’t change them if the same name is presented, whatever is there is just left alone. I quickly copy and paste them in if there is a new name. So that Decorate name was in there from the first time. I am currently 9 points behind. I’m 6 points up, quite amazing really I expected more! It’ll be interesting how it looks as the season progresses! Really pathetic considering I played my WC already. Yeah I played mine at the same time! Still don’t regret it mind! I often feel a weight is lifted once you’ve played it, feel my squad has a good spine and hopefully it outscores mu GW1 team long term!! 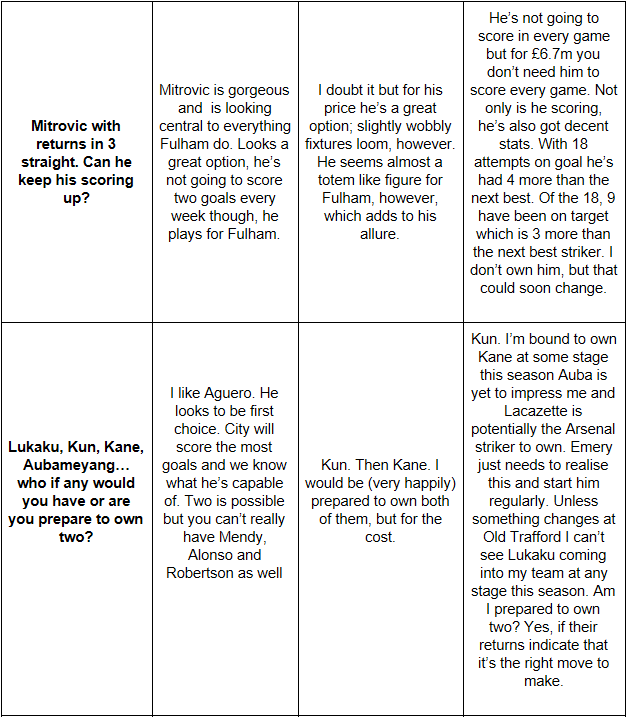 Interesting thanks Mito ……..45 points up, maybe my tinkering is not so bad or my team was terrible to start with! Thats huge!!!! What was your GW1 team?? Tools like this can torment your life with bittersweet ‘what ifs’. Mercifully though I’m 14 ahead. That will be down to captain choices not the transfers I’ve brought in. Interesting little tool. I’m 8 points up, but then I’ve also taken a couple of hits and built 1.7 in team value, so it’s not as depressing as it first seems. Well worth a bookmark that, if they developed it further to elimate certain aspects and leave others in such as removing transfers but still accounting for captain switches it’d be very handy indeed. Same sort of concept I used for the To Hit or Not To Hit articles for the magazine thing last season. I digress, I’m up 31 apparently, 248 as opposed to 279 but as Kralin said that’s probably capos and almost certainly all is as I had Salah GW1 and had Kun when he hit 40 points or whatever it was. This is nice Mito but I am scared to look at this one which tells you how many points you’ve wasted on the bench. That’s a good one too. That’s edging towards my wish list one as per above. The best bit is the one telling you about the C and VC decisions. That’s where most points are lost if you get it wrong. 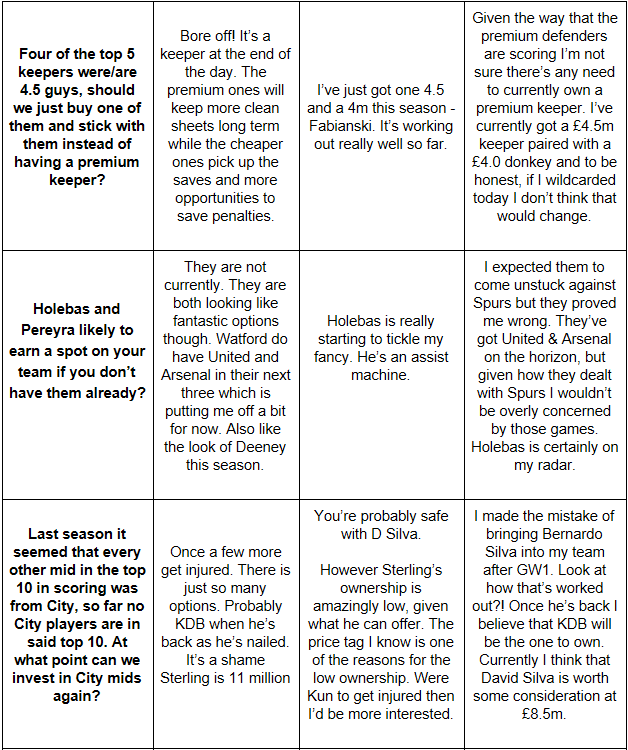 I’d have lost 54 by swapping them, but again that’s mainly down to Kun’s mad week. I’m guessing a fair few will be on the other side of that argument simply because of that Jamie Jackson bloke or whatever his name was. That’s true. At least I got this one right. The rest is disaster, starting with GW 1 leaving 41 points on the bench. And the curse is still there. Still difficult to know what to say about that Ivan…. 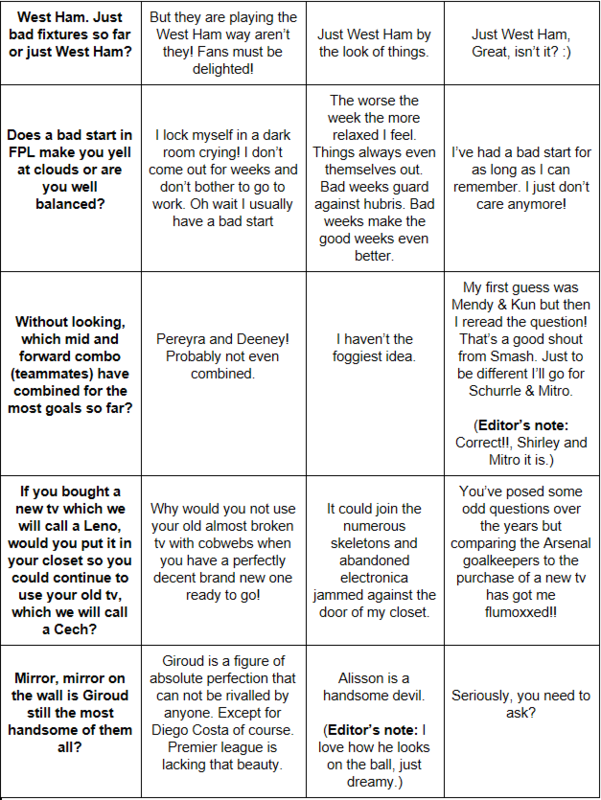 you selected the correct players I suppose………..
2pts behind! 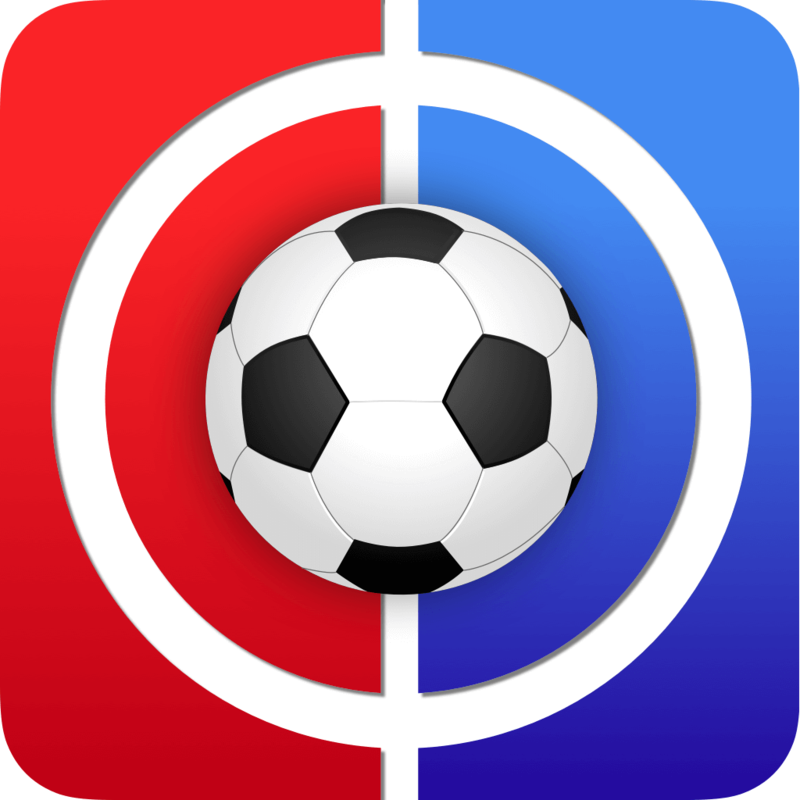 Great to realize that “managing” my FPL team is completely useless!!! Another fantastic GABO, cheers everyone. Silly question, where do I find my FPL ID#? Best customer service around Cheers Innit. Love a good GABO guys! Highlight of the IB for me!! 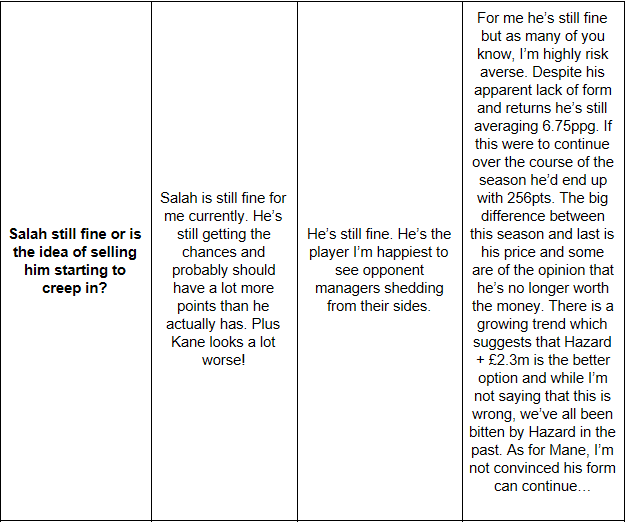 I think a lot of the arguments for/against Salah have been made, so I won’t go there. Am interested in why you’ve not gone for Mendy though. I’d have him in by some distance ahead of Smalling. Uncanny! I isolated Robertson as I figured they were more comparable price wise and an easier swap but yeah I wasn’t taken on the Smalling pick either. Their 3 after Watford look ok though in terms of CS potential I guess. Oh yeah, Man U’s fixtures are all right, absolutely fine in fact. I’d keep Shaw if I had him. But I’d fancy Mendy going seriously mental in at least one of the City games in the same period. Though I daresay he’ll be rotated at some point. 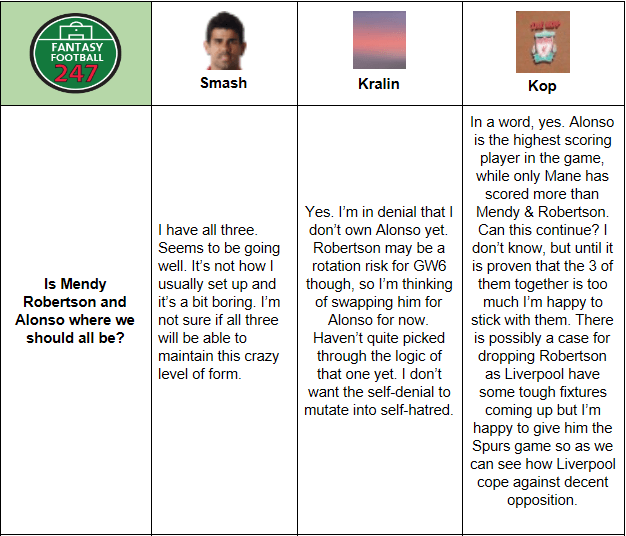 Hi Jamie, apart from the obvious omission there who I won’t mention as it’s long been debated already, would it not be worth having Mendy in there instead of Robertson, for now anyway at least. 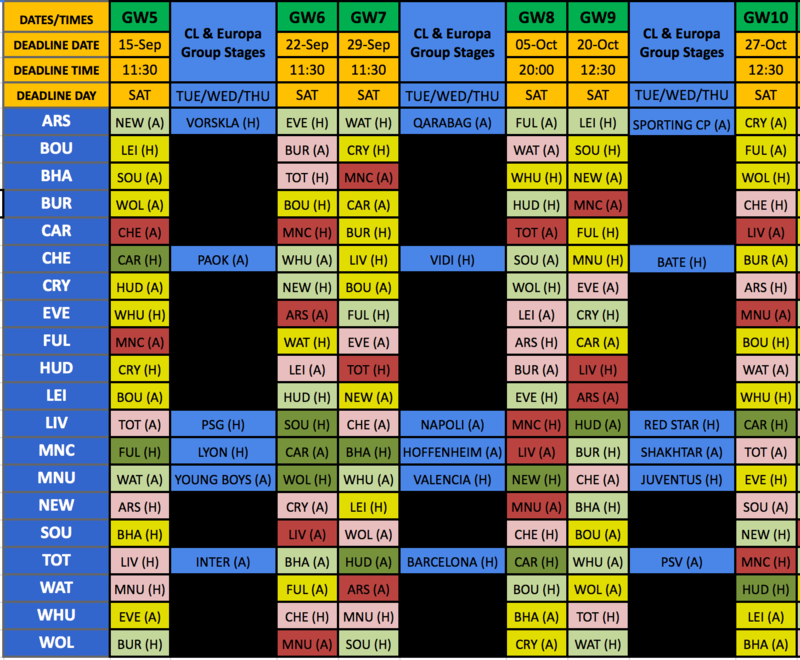 Their fixtures in the next 4 are at different ends of the difficulty spectrum. Never thought of that init but robbo is a season keeper. I’m completely undecided about whether to drop Robertson or not. I know the fixtures, the rotation risk. But I also know I’ll want him back in once the dust settles – and I doubt I’ll be swapping him for either Alonso or Mendy. I’ll want all three then as I do now. I’ve decided he is a set and forget unless injured – I think Liverpool have looked at their strongest on the left of the field and even if he doesn’t get clean sheet points I can see him racking up assists (and if they do keep any CS’ his attacking play will make him a bonus point magnet). Who is best between smalling, richarlison and schurrle or mendy, richarlison and Fraser? Option two by some distance. I had salah and mickyt changed to mane and hazard. Annoyed that mickyt came on for 1 minute last week. Seriously thinking of Mendy and some cheap midfielder against smalling and richarlison. If I go one way I’ll be looking at Neves or Fraser, probably. A very close call because there’s not a lot between them, to my eye anyway. Fraser’s being closer more often in / around the opponents’ penalty box may swing it but I still fancy Neves. Evening all. Really enjoyed the GABO article as always – excellent way to break up the IB and good to see a new writer in Kralin. I have a bit of a conundrum. After GW8 I will be off-line for 3 or 4 GW’s so need to have a team set up to sail as a ghost ship for a bit, so I’m planning my transfers ahead. Problem is, I can’t make up my mind whether to stay with 4-4-2 or move to 3-5-2. 3-5-2 would mean Bavies > Bennett or Cedric. Midfielders I want to change are Mkhitaryan & Bilva, who I just don’t think are secure, and Jota, who seems to be rubbish! Also will probably need to upgrade Kamara, and change King (though he is a low priority change). Considering several including Hazard, Dilva, Pererya, Maddison & some cheapies to replace – Haz is only really do-able with the 4-4-2 set-up. I’ve got 2 FT and 0.1 ITB. Given fixtures for Bilva & Jota I can live with them for another week, though equally happy to take a hit getting rid of them! Anyone able to help me steer a way ahead? 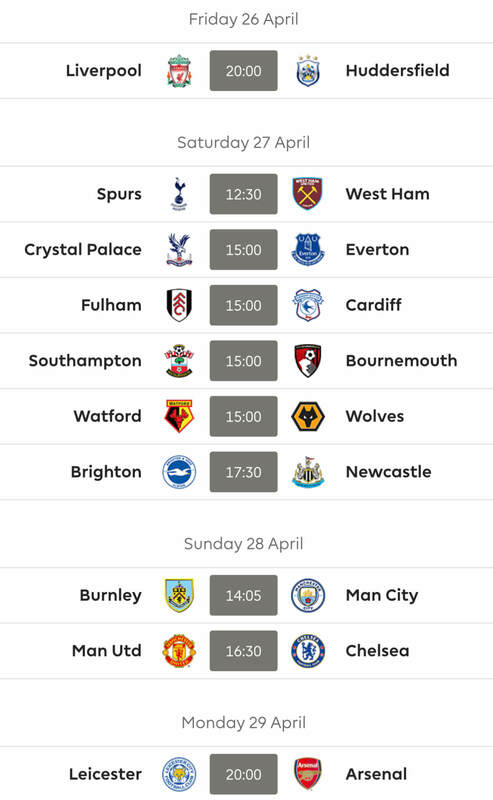 I think in your shoes – the unmoored ship, drifting out of the harbour, wind cyclonic 4 or 5, increasing 6 at times, occasionally 7 later – I’d play the wildcard just before with a very close eye on the fixtures from weeks 9-12. 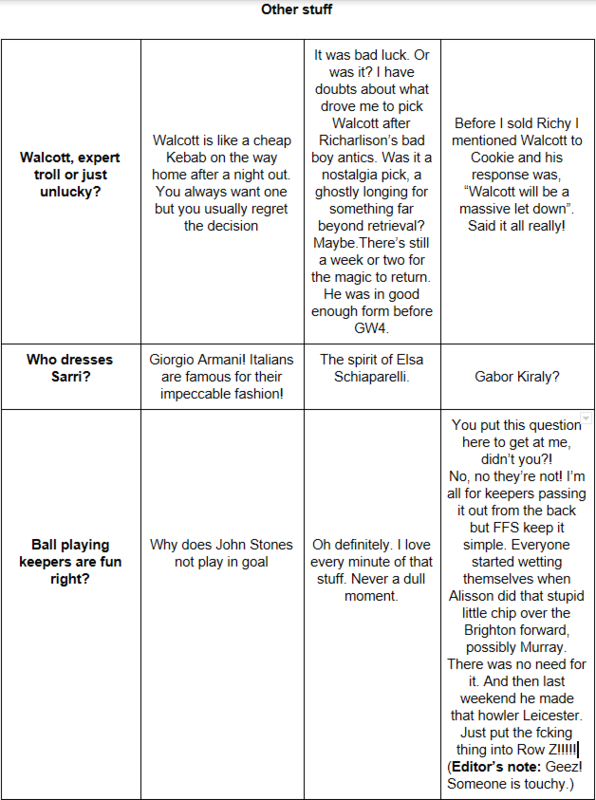 We’ll know a lot more in week 8 about who’s in form, who has the decent fixtures etc. 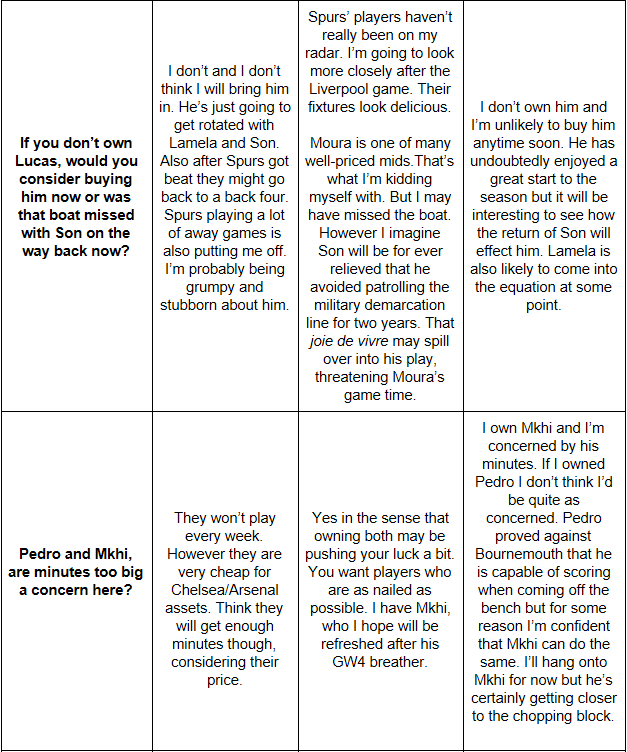 Eg now, it looks like B&HA have some good fixtures in your period of fantasy exile. But they may be in decline in the weeks leading up. This is getting scarily uncanny now. Maybe we should just arrange a shift pattern?! It happened a lot (similar posts, as if we were playing snap) to me on FFF with another manager there, Old Goat (who of all the managers over there was the one I most hoped would come over here). Anyhow, can I leave you with midnight to 6am? That’s absolutely fine, I shall quit my other job now with immediate effect! Shame he’s not come over. Is he aware? The name rings a bell. Are you in contact with him elsewhere? I’ve asked him many times but he seems to be busy with something. Yes, he knows about here. I was in touch, slightly, but he was a bit burnt out (he pretty much took on RMTs single-handedly in the last weeks of the site) at the end of the season so I’ve haven’t hassled him about it. Ok cool, well hopefully he may reenergise and gravitate in time. All seems a bit chaotic if I’m being totally honest Robbo! In all seriousness if I knew I was defo offline for such a period (heck are you going?!) I’d probably just keep playing week by week for now and almost certainly simply WC before I left to give myself the best chance of keeping pace over that time. On Mikhi, looking at the here and now, I’ve got him myself and I’m a bit concerned as I saw the Arsenal highlights before and I’m not sure who he’s supposed to replace there to get back in unless Rambo drops back again in place of Xhaka, who really does need replacing! Rambo looked good where he was though. Apropos nothing, if you didn’t catch the highlights or the game itself it’s worth a watch just for the hilarity of Cech’s inabilty to cope with any back pass, of which they seem to be insisting on playing a lot of! 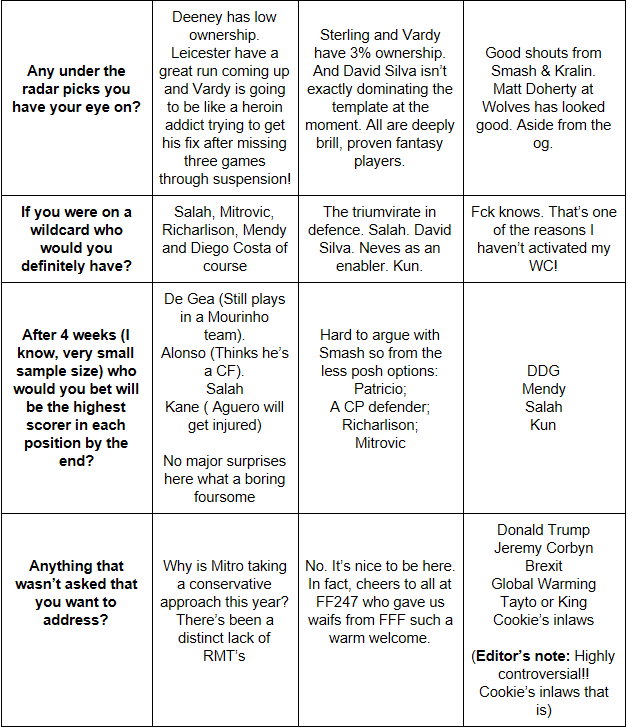 Thoughts on WC are above in my reply to Kralin, though I can see the benefits as well – shame I can’t roll over ALL my transfers for when I get back. It’s Cuba btw, hence off-line as it’s just too much hassle to get the internet there. I was struggling to see a place for Mkhi as well when I watched it, so might just ditch him this GW. It was excellent comedy watching the ball going back to Cech – I think he must have pissed off the defenders and they are getting revenge! I can see how that’d also be a benefit as yes it may well indeed be a mess when you return too! Personally speaking I’d simply hand my team over to Cookie, is that not an option? I don’t mean him specifically of course but is there not someone you know who plays and you can trust to run it sensibly for a few weeks? Might be an idea on the handover, but I also quite like the challenge of setting the team up to survive it. I’m actually coming round to the WC idea as even if I was really unlucky with injuries, surely I wouldn’t lose more than 4 or 5 players, so could get straight back up to a playing 11 with my 2 FT’s on my return.